Location: Barly, in the Pas-de-Calais departement of France (Nord-Pas-de-Calais Region). Notes: Château de Varlemont is a castle located in the municipality of Barly (Pas-de-Calais). 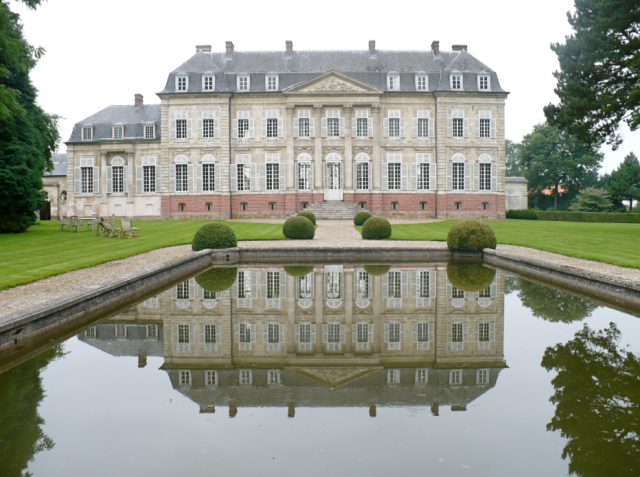 The castle was probably built between 1782 and 1784 by Vindicien-Antoine Blin, former captain in the regiment of Rohan. The work of interior design and construction of outbuildings were continued until 1794 by his son, Jean Vindicien Blin Varlemont. It remained at Barly during the Revolution, and from 1812 to 1818 put the castle available to the Arras Bishop of La Tour d'Auvergne, in the summer. After his death in 1832, his son sold the castle to the Countess of Tramecourt, who bequeathed it in 1879 to the Marquis of Luart. M.Duhem the 1914 to 1937. Busy possessed by the armies in the last war, it was in very bad condition when it was acquired in 1970 by Count Jacques d'Antin Vaillac, which ensures the restoration. The castle and its outbuildings (chapel, common, entrance gate) is classified as historical monuments by order of 2 March 1971.